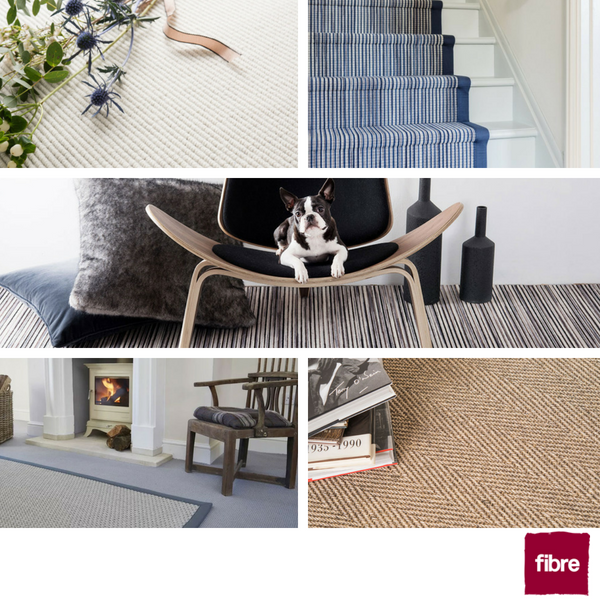 Fibre Flooring offer creative carpets, stair runners and rugs that are not only luxurious, but incredibly hard wearing and environmentally friendly too. Designed for use anywhere in the home, Fibre Flooring have a large in-depth range of styles and patterns from Herringbone to Deep Pile Loops and Sleek Stripes in their wool carpet portfolio plus a comprehensive range of traditional Sisal and Seagrass designs in the natural carpet offering. Wool Carpets- If your priority is finishing your home with a stunning carpet that's built to last, then look no further than the collection of Wool Carpets on offer from Fibre Flooring such as the trendy Flatweave Classic Big Boucle, fashionable Longitude Stripe Carpet and the super soft Verbier Carpet that's perfect for bedrooms and lounges. Natural Floor-Coverings- Highly renowned for their natural floor coverings, fibre have an wide selection of natural carpets on offer. These include the popular Sisal Havanna Herringbone, Seagrass Panama Natural and the Coir Boucle Natural which are all produced with the highest quality natural fibres making them unbelievably durable and suitable for high-traffic areas such as stairs and hallways. Fauxsal- One of Fibres latest innovative creations is the fauXsal sisal-look floor that has the look and feel of a traditional sisal carpet but with the added bonus of being fully bleach cleanable and easy to maintain making this the perfect alternative for the busy modern home. Rugs and Carpet Runners- Fibre Flooring offer the opportunity to choose any of their carpets ranges and have them made into stylish rugs and runners with an excellent choice of edgings to suit your needs. The extensive range of colours and patterns that are made from materials such as cotton, linen and leather offer endless options to complete your dream floor.